If you mess with the bull, you get the horns. This was the lesson learned by Jonathan Lopez, who took a fight on short notice to challenge New York Fight Exchange welterweight champ Jerome "The Bull" Mickle at Saturday night's NYFE 2: "Ides of March" show. Once again, NYFE packed the Amazura Concert Hall in Jamaica, Queens, and once again Mickle took his role as main eventer seriously, putting on an exciting and violence-filled performance to cap off a night that saw quite a bit of action in the cage. 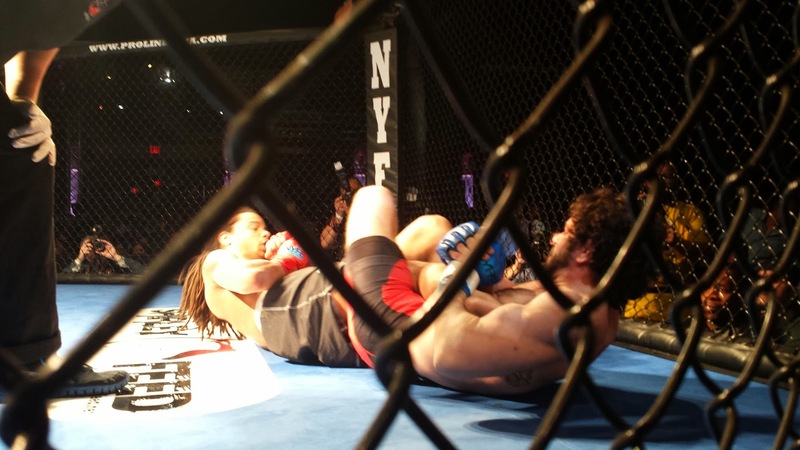 In the opening frame of bout, Lopez briefly managed to penetrate the champ's defenses with his striking, but for pretty much the rest of the fight it was all about Mickle getting the Long Island native down and dropping bombs from above. Success via TKO came at 1:34 of Round 2, bringing Mickle's record to a spotless 10-0. Controversy clouded the co-main event. Defending his featherweight against upstart Rob Scotti, Felipe Carlos was composed and dangerous - two traits that enabled him to win the belt at the NYFE's inaugural show. But at a little over a minute into Round 2, he was a caught in a heelhook attempt. Carlos didn't tap, but his pained reaction was enough for the ref to stop it - which, given the role of referees in protecting fighters and the discretion they have in amateur bouts, is understandable. Was the ending as conclusive as everyone wanted? Of course not. However, erring on the side of safety is most important. Hopefully, the two will rematch in the future. Robert Diggle's nice submission over Uniah Banks, which blended technique with dogged resolve. The back-and-forth battle between Elija Punzone and Eric D'Arce. It was close, and Punzone ended up with the split decision, but it was a war. Kenny Sweeney's successful MMA debut, which had him on the losing end of the grappling-heavy scrap he and Matt Shamloo were having - that is, until somewhere along the lines Shamloo wound up with a broken nose, thereby ending the fight. Pedro Villa's dominant ground game, which he put to good use controlling and eventually submitting Will Joya. The NYFE's next show is in June, and with two stellar events in the books, it's a safe bet NYFE 3 will be a must-see.